A Different World is an American sitcom and a spin-off of The Cosby Show which aired for six seasons on NBC from September 24, 1987 to July 9, 1993. The series originally centered on Denise Huxtable (Lisa Bonet) and the life of students at Hillman College, a fictional historically Black college in the state of Virginia, inspired by student life at Hampton University. After Bonet's departure in the first season, the remainder of the series primarily focused more on Southern belle Whitley Gilbert (Jasmine Guy) and math whiz Dwayne Wayne (Kadeem Hardison). While it was a spin-off from The Cosby Show, A Different World typically addressed issues that were avoided by The Cosby Show writers (race and class relations, or the Equal Rights Amendment). One episode that aired in 1990 was one of the first American network television episodes to address the HIV/AIDS epidemic. The original premise was to have a white student there and have Lena Horne as an acting teacher, but in production, the premise changed from being a story about a white girl in a black college to a black girl (Denise Huxtable) in a black college with a white friend. It was ultimately decided that Denise, who was of college age, would be spun off and have a white roommate in order to show the dynamic of a white girl in predominantly-black surroundings. Meg Ryan was originally cast for this role, but she decided to pursue a film career, so Marisa Tomei was cast. The first season of Hillman's student body consisted of both black and white students, but this was changed at the beginning of the second season and a very predominantly-black student body maintained until the series ended. The season five episode "Love Taps" dealt with domestic violence. Gina has been dating an up-and-coming rapper named Dion, aka "I'm Down" (played by Edafe Blackmon), who many of the students admire, including Terrance. When Lena suspects that Dion has been beating up on Gina (who is sporting a black eye), she confronts her about it, but Gina makes excuses for Dion's rages and tells Lena to back off. Lena confides in Kim about Gina's situation; Kim informs Lena that some things should not be kept secret. Eventually, Dion's reputation is spread all over campus. After having a heart-to-heart talk with Whitley and engaging in a confrontation with Dion (in front of Terrance who has called the police), Gina finally decides to press assault charges against him. Various episodes in the last two seasons of the series referenced contemporary high-profile cases of sexual harassment, such as the Mitsubishi scandal and the Clarence Thomas-Anita Hill hearings. In the episode "Bedroom at the Top," Whitley is sexually harassed at her new job by an executive. The Anita Hill hearings also are mentioned in the episode "The Little Mister," in which Dwayne dreams about the 1992 elections imagining himself as Hillary Clinton, while Whitley is Bill. The theme song was co-written by Stu Gardner, Bill Cosby, and Dawnn Lewis – who was also a cast member. In the online interviews related to the 2006 "Hillman College Reunion," Lewis revealed that her being approached to write the song and to audition were two separate events that occurred within a short time of each other, such that she thought it was a practical joke by her friends. The song was performed by Phoebe Snow in season one, then by Aretha Franklin in seasons two through five, and Boyz II Men in season six. The spin-off program featured many appearances by characters from the parent program, especially in the initial season, in which Denise's father Cliff (Bill Cosby), mother Clair (Phylicia Rashad), younger sisters Vanessa (Tempestt Bledsoe) and Rudy, brother Theo (Malcolm-Jamal Warner), and grandfather Russell (Earle Hyman) all appeared on the show, either at Hillman or at the other end of a phone call. Denise's departure from Hillman after Season 1 did not stop her mother from reappearing on the show. Three of Phylicia Rashad's four appearances as Hillman alumna Clair Huxtable took place after season one, and in one of these, she brought her younger daughter Vanessa to tour the college. Sondra was the only Huxtable child not to appear on the show. Martin (Joseph C. Phillips) and Olivia (Raven Symone) appear in season 3 episode "Forever Hold Your Peace" along with Phylicia Rashad and Lisa Bonet. Elvin (Geoffrey Owens) and Pam (Erika Alexander) never appeared on the show. Hillman College is a fictional, historically Black college, founded in 1881 and located in the commonwealth of Virginia. The exact locality of the school is never revealed, but several geographic references are made which allude to the campus being located somewhere between Richmond and the Hampton Roads area. The school's motto is Deus Nondum Te Confecit, which literally translates from Latin to: God has not yet finished. The school colors are maroon and gray. Visual shots of the Hillman campus that were used in the series were actually filmed at two real-life Black colleges, Clark Atlanta University and Spelman College, both in Atlanta, Georgia. Urban Works released Season 1 of A Different World on DVD in Region 1 on November 8, 2005. Several release dates for Season 2 were announced (May 2006, July 2006 & September 2006) but it was never released. Urban Works was acquired by First Look Studios in early 2006. The distribution rights for the series have since reverted back to the production company, Carsey-Werner Productions. While subsequees of the program can be found on the Hulu Plus streaming service and as of March 23, 2015, all 6 seasons are available for view on Netflix. ↑ Haithman, Diane (October 6, 1988). "Different Touch to 'Different World'". Los Angeles Times. Retrieved October 2, 2010. ↑ La Deane, Alice (January 13, 1992). "'Different World' Goes Beyond Realm of 'Sitcom'". Los Angeles Times. Retrieved October 2, 2010. ↑ "Jay Sandrich". Archive of American Television. Retrieved March 9, 2014. ↑ "Anne Beatts". Archive of American Television. Retrieved March 9, 2014. ↑ "Marcy Carsey". Archive of American Television. Retrieved March 9, 2014. 1 2 "Debbie Allen". Archive of American Television. Retrieved March 9, 2014. 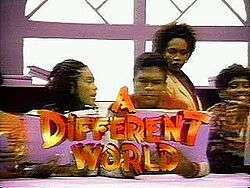 ↑ "As 'A Different World' Turns". EW.com. Retrieved November 11, 2013. ↑ Braxton, Greg (August 13, 1992). "A 'Different' Take on the L.A. Riots : Television: Industry and Civic Leaders are Both Impressed and Nervous as 'A Different World' Opens a New Season by Dealing with the Unrest". Los Angeles Times. Retrieved October 2, 2010. 1 2 3 4 5 6 "The Museum of Broadcast Communications – Encyclopedia of Television". Museum.tv. Archived from the original on February 10, 2006. Retrieved November 11, 2013. 1 2 "TV Ratings: 1988–1989". ClassicTVHits.com. Archived from the original on January 15, 2010. Retrieved December 2, 2010. 1 2 "TV Ratings: 1989–1990". ClassicTVHits.com. Archived from the original on January 17, 2010. Retrieved December 2, 2010. ↑ Earl g. Graves, Ltd (October 1990). "Nielsen To Scope Blacks". Black Enterprise. 21 (3): 18. 1 2 "TV Ratings: 1990–1991". ClassicTVHits.com. Archived from the original on February 6, 2010. Retrieved December 2, 2010. 1 2 Company, Johnson Publishing (April 27, 1992). "Debbie Allen Tells Why 'A Different World' Is Rated Tops Among Black TV Viewers". Jet. 82 (1): 58–60. 1 2 "TV Ratings: 1991–1992". ClassicTVHits.com. Archived from the original on January 15, 2010. Retrieved December 2, 2010. ↑ Grahnke, Lon (May 8, 1993). "'A Different World' Canceled After 6 Years". Chicago Sun-Times. p. 21. Retrieved May 25, 2010. ↑ Company, Johnson Publishing (April 26, 1993). "How Blacks' TV Viewing Habits Differ From Whites'". Jet. 83 (26): 38. ↑ Aziz, Naeesa. "Where Are All the Black TV Shows? | News". BET. Retrieved November 11, 2013. ↑ "Danielle Moodie-Mills: Lessons From 'A Different World'". Huffingtonpost.com. Retrieved November 11, 2013. ↑ "Will The Days of "A Different World" Ever Return? " MadameNoire MadameNoire". Madamenoire.com. May 24, 2011. Retrieved November 11, 2013.